As of November 2018, ZAUM have signed with France based LISTENABLE RECORDS (Gojira, Immortal, Mars Red Sky, etc) with a European April 26 2019 release date for full length album # 3 titled “Divination” with North American distribution via eOne (Entertainment One). 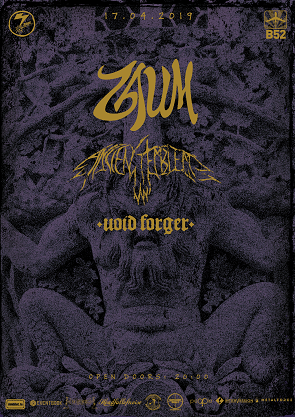 ZAUM were the recipients of the ECMA Award in 2018 for Loud Recording Of The Year, and MNB Award for Best Loud Artist of 2016 and 2017 consecutively in Canada. In their 4 years as an active touring band they’ve amassed 200+ shows (mainly international) under their belts including showcases at Roadburn 2017 (NL), Haywire Festival 2016 (RO), and Incubate Festival 2014 (NL). In July 2018, ZAUM released a music video for “The Enlightenment” shot/edited/conceptualized by renowned Canadian film studio CUT/OFF/TAIL as a final support piece for Eidolon.